Recently I took some trails through the mountains in Taipei and ended up at Shih Hsin University (Shìxīn Dàxué / 世新大學). Near the school are some interesting signs. Rather than giving individual posts for each of these, I’m keeping the signs together in this one, as this is better testimony to the increasing and often playful diversity of languages and scripts in Taiwan. 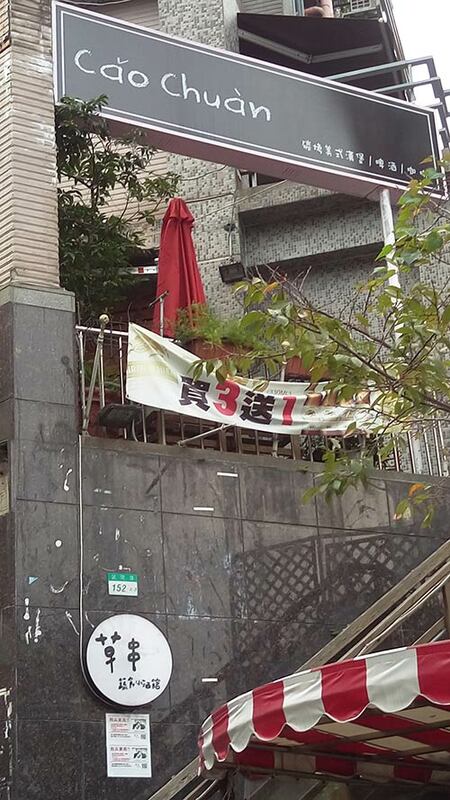 Here’s a restaurant whose name is given in Pinyin with tone marks! That’s quite a rarity here, though I suspect we’ll be seeing more of this in the future. The name in Chinese characters (草串) can be found, much smaller, on a separate sign below. Right by Cao Chuan is Èrgē de Niúròumiàn (Second Brother’s Beef Noodle Soup). Note the use of the Japanese の rather than Mandarin’s 的; this is quite common in Taiwan. This store has an ㄟ, which serves as a marker of the Taiwanese language. Here, ㄟ is the equivalent of 的 — and of の. Since I just posted about the new Hakka-based Chinese character input method I would be amiss not to note as well the release early this year of a different Chinese character input method based on Taiwanese romanization. This one is available in Windows, Mac, and Linux flavors. See the FAQ and documents below for more information (Mandarin only). It’s time for another installment of Government in Action. I have mixed feelings about this move. On the one hand, I’m pleased to see a representation of a language other than Mandarin or English on Taiwan’s signage. “Tamsui” is the traditional spelling of the Taiwanese name for the city. And it hardly seems too much for at least one place in Taiwan to be represented by a Taiwanese name rather than a Mandarin one. On the other hand, the current move unfortunately doesn’t really have anything to do with promoting or even particularly accepting the Taiwanese language. It’s not going to be labeled “Taiwanese,” just “English,” which is simply wrong. It’s just vaguely history-themed marketing aimed at foreigners and no one else. But which foreigners, exactly, is this supposed to appeal to? Perhaps Taiwan is going after those old enough to remember the “Tamsui” spelling, though I wonder just how large the demographic bracket is for centenarian tourists … and just how mobile most of them might be. A key point will be how “Tamsui” is pronounced on the MRT’s announcement system. (I haven’t heard any changes yet; but I haven’t taken the line all the way out to Danshui lately.) The only correct way to do this would be exactly the same as it is pronounced in Taiwanese. And if the government is really serious about renaming Danshui as Tamsui, the Taiwanese pronunciation will be the one given in the Mandarin and Hakka announcements as well as the English one. Moreover, public officials and announcers at TV and radio stations will be instructed to say Tām-súi rather than Dànshuǐ, even when speaking in Mandarin. But, as years of painful experience in this area have led me to expect, my guess would be that the announcements will not do that. Instead, it will be another SNAFU, with a mispronunciation (yes, it is almost certain to be mispronounced by officialdom and those in the media) being labeled as “English”. Of course, there’s nothing wrong about saying “Tām-súi.” But it’s a pretty safe bet that isn’t going to happen: the name will likely be given a pronunciation that a random clueless English speaker might use as a first attempt; then that will be called English. This sort of patronizing attitude toward foreigners really makes my blood boil. So I’m going to leave it at that for the moment lest my blood pressure go up too much. 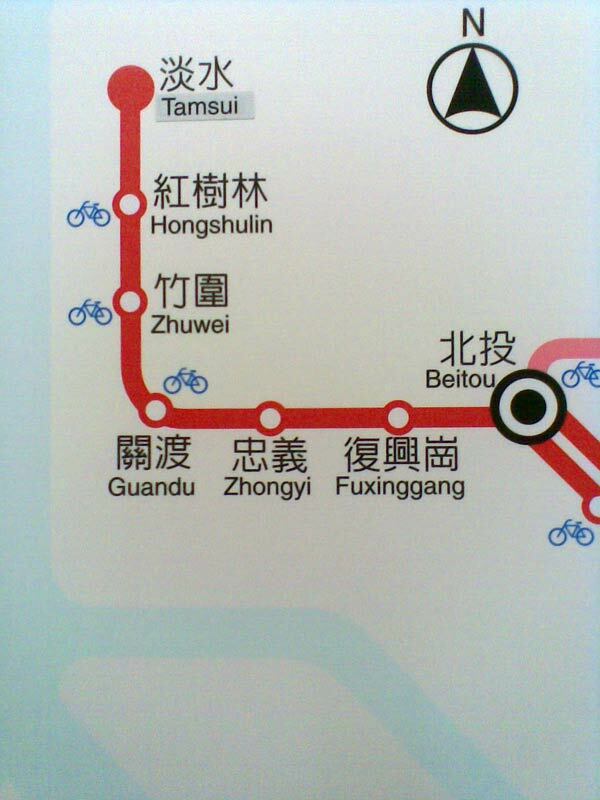 So, once again, the MRT system is taking something that was perfectly fine and changing it to something that will be less useful — and all the while continuing to ignore miswritten station names, stupidly chosen station names, mispronunciations, and Chinglish-filled promotional material. Please keep your ears as well as eyes open for instances of “Tamsui” and let me know what you observe. 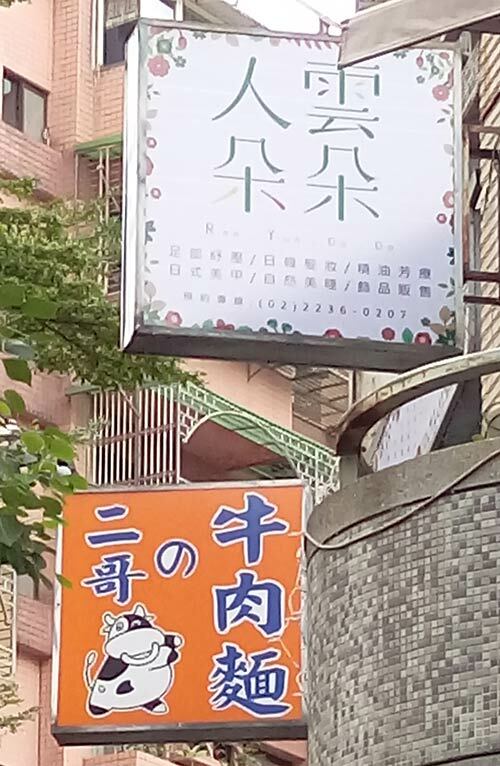 The city, by the way, has already started using “Tamsui” instead of “Danshui” on lots of official road signs, as I started seeing several months ago and which I noticed in increasing use just last week when I passed through that way. I probably should have taken a more active stance on this months ago; but I was too busy working against the bigger and even more ridiculous anti-Pinyin change of “Xinbei” to “New Taipei City.” Fat lot of good that did. Maryknoll Language Service Center has put online the complete texts of its Taiwanese-English and English-Taiwanese dictionaries. Better still, these have been released under a Creative Commons license. These are a terrific resource for anyone who’s interested in Hoklo. Maryknoll deserves praise for this great work. Thanks are due, too, to Tailingua, which I know has been working behind the scenes to help make this happen. The Web site for Sino-Platonic Papers, Professor Victor Mair’s iconoclastic journal, has expanded to the point that, as of the most recent batch of reissues, it offers more than half of the journal’s 198 (and counting) issues in full and for free. So if you haven’t visited that site recently you might want to have another look. The Magical Kunlun and “Devil Slaves”: Chinese Perceptions of Dark-skinned People and Africa before 1500, by Julie Wilensky. Last summer I promised some friends in Beijing that I would get this one online. I’m less than a year behind, which means I’m improving…. Dogs and Cats: Lessons from Learning Chinese, by Julie Lee Wei. Most SPPs are full of details and references. This, however, is a lovely personal essay that I believe will strike a chord for many readers, especially those who count themselves as “overseas Chinese” and have had to work at learning Mandarin. On the Problems of Chinese Lettered Words, by Liu Yongquan of the Chinese Academy of Social Sciences’ Institute of Linguistics. This isn’t so much a list of words (which is the sort of thing that would become out of date almost as soon as it was issued) as a proposal for a classification system to deal with the different types of such terms. The Life and Mentorship of Confucius. This is by E. Bruce Brooks, an important and revolutionary scholar of Confucius. Unfortunately, at least from my point of view, Brooks prefers to use a romanization system of his own devising; so that can take some getting used to. A Southern Min Word in the Tsu-t’ang chi, by Tim Miller — a short piece for those of you who are especially interested in all things Hoklo/Minnan/Taiwanese. the online availability of all twelve volumes to date of book reviews (nos. 8, 14, 31, 35, 46…). These in general are particular favorites of mine. the publication of the largest SPP to date: John C. Didier’s In and Outside the Square: The Sky and the Power of Belief in Ancient China and the World, c. 4500 BC – AD 200, a massive work in three volumes. Below: A chart from SPP 198, Aramaic Script Derivatives in Central Eurasia, by Doug Hitch. The newly redesigned Tailingua has just issued a useful list of dictionaries of the Taiwanese language and related dialects (PDF). Dyer, Samuel 萊撒母耳 (1838 ). A Vocabulary of the Hok-keen Dialect as Spoken in the County of Tsheang- Tshew [漳州音字典]. Malacca: Anglo-Chinese College Press. Embree, Bernard L.M. 晏寶理 (1973). A Dictionary of Southern Min [閩南語英語辭典]. Kowloon: Hong Kong Language Institute. Fùxīng wénhuà shìyèshè 復興文化事業社 (2004). Táiwān mǔyǔ yīnbiāo zìdiǎn 臺灣母語音標字典 [Taiwanese mother tongue pronunciation dictionary]. Táinán: Fùxīng Wénhuà Shìyèshè 復興文化 事業社. Hare, G.T. (1904). The Hokkien Vernacular [福建白話英文字典]. Kuala Lumpur: Straits Settlements and Selangor Government Printing Offices. Hóng Guóliáng 洪國良 (2004). Héluòyǔ yīnzì duìzhào diǎn 河洛語音字對照典 [Comparative dictionary of Ho-lo pronunciation]. Gāoxióng: Fùwén 復文. Hóng Hóngyuán 洪宏元 (2009). Xuéshēng Tái–Huá shuāngyǔ huóyòng cídiǎn 學生台華雙語活用辭典 [Bilingual everyday Taiwanese–Mandarin dictionary for students]. Táiběi: Wǔ Nán Túshū Chūbǎn Yǒuxiàn Gōngsī 五南圖書出版有限公司. Hú Xīnlín 胡鑫麟 (1994). Shíyòng Táiyǔ xiǎo cídiǎn 實用臺語小辭典 [Practical pocket Taiwanese dictionary]. Táiběi: Zìlì Wǎnbào Chūbǎnbù 自立晚報出版部. Here’s something from an ad I saw on the Taipei subway (MRT). It features cartoons of George W. Bush and Barack Obama shilling for some vitamin drink. Hē guǒzhī bùnéng zhǐyǒu wéitāmìng C.
Not just vitamin C, not just vitamin C.
When you drink fruit juice, you should not settle for just vitamin C.
Note: The C is italicized in the Pinyin version to emphasize that this is pronounced like a foreign (i.e., English) letter C rather than how C is pronounced in the Pinyin alphabet. The reason for this is that “bù C” is a pun on “Bush”, whose name in Taiwan is generally pronounced in Mandarin as Bùxī, unlike in China, where it is usually pronounced Bùshí. Mǎi guǒzhī bù yào hēibái mǎi. But the text tells people to read 歐八馬 (Ōubāmǎ/Obama) as Taiwanese (Táiyǔ), which means that it’s pronounced Au3-peh4-be2, which is a pun with what is written, in red for emphasis, 黑白買. 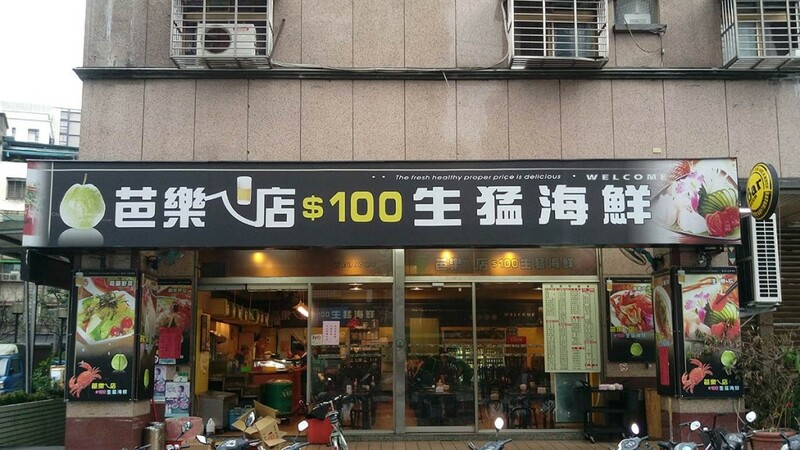 黑白買 in Mandarin is hēibái mǎi, which means to buy things indiscriminantly. In Hoklo (Taiwanese), however, this expression is O.1-peh4-boe2, thus a pun on Au3-peh4-be2 (Obama). Also, hēibái by itself is simply “black [and] white” (as in Obama and Bush). And Obama’s name, like Bush’s, has different Mandarin forms in Taiwan and China. But that doesn’t have much to do with the ad. 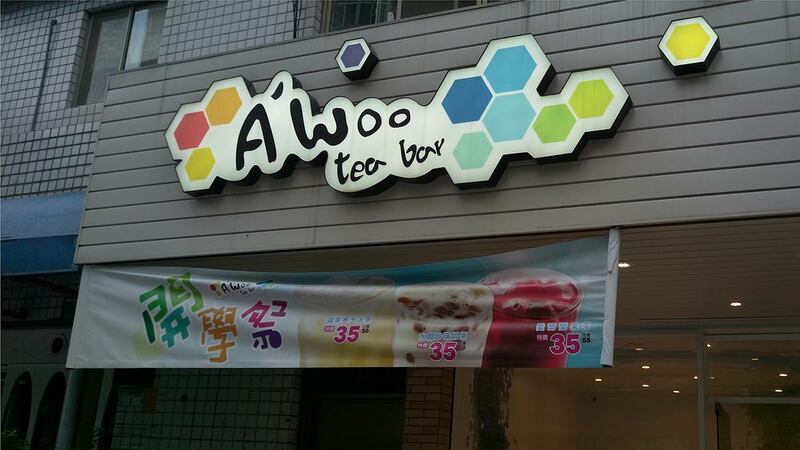 As always, I welcome those who (unlike me) know Taiwanese romanization well to correct anything that needs fixing. Thirty years ago I launched the Speak Mandarin campaign. [Singaporean] Chinese students learned Mandarin at school. Unfortunately, they used to speak dialects amongst themselves, at home, and with their friends — a variety of dialects. Here, “dialects” is of course the standard misnomer for Sinitic languages other than Mandarin. Lee said that he himself was setting a bad example during the 1960s and 1970s by doing such highly irresponsible things as giving speeches in the native language of the majority of Singapore’s citizens. So he stopped all that. And he had the government shut down almost all broadcasts in Hokkien (Hoklo) and other such languages. Actually, no, that’s not clear at all. Rather, a very different trend is apparent. During his speech Lee displayed the graph below, with data taken from surveys conducted by Singapore’s Ministry of Education. Of course the government and Lee recognize this. But they don’t want to fight against English, which is crucial to Singapore’s success. So what Lee is proposing is that parents — both parents — speak Mandarin, not English, to their children. Lee explained in his speech that people have only so many “gigabytes” in their brains to devote to languages. Thus, those rubbish languages must be destroyed “dialects” must be let go, he said. Part of the reason behind Lee’s call, however, is a basic misunderstanding. Setting aside the matters of educating children in a language not native to them and how many languages most people are capable of speaking effectively, the main difficulty with learning Mandarin is not the language itself (especially for those who speak other Sinitic languages) but Chinese characters as its near-exclusive script. If Singapore is smart about promoting Mandarin, sooner rather than later it will develop a two-track system, with most students studying how to read and write Mandarin exclusively in Hanyu Pinyin, while those who wish become more specialized can go on to study Chinese characters as well. For this to work, Singapore will need to produce plenty of material to read in Pinyin. (A newspaper, for example, would be a must — and one with real news, not just cute stories for kids.) The city-state certainly has the means and motive for this. But does it have the imagination? If it does, most students could save their precious neurons and gigabytes for other things — perhaps even their families’ traditional native languages.